You can’t help but wonder how many short-lived products are released solely for the purpose of generating a spin of controversy and media attention during periods of slow sales. Adidas have hit the news in a big way with their sudden recall of the JS Roundhouse Mid (the product of a collaboration with fashion designer Jeremy Scott). The shoes were due to be released in August this year, and had been previewed on the Adidas Originals Facebook page in a photo posted on June 14. However, critics went wild over the shoe, a fairly nondescript and fugly sneaker in purple, greys, black and orange. It was not the shoes themselves but their accessories that caused the furor. Notice the rather attractive Adidas branded ankle shackles attached to the sneakers. 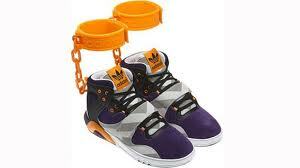 Critics of the sneakers were furious, stating that they were offensive to African-Americans in particular due to the slavery and chain gang imagery invoked by the shackles. As a result, the sneakers were pulled from the Adidas collection. Missouri-born Scott has established an enviable design history of controversy, humour, shock and awe with regards to his work, having dressed anyone who’s anyone in the film and music industries, also being the man responsible for those horribly irresistible harem pants in animal or glitter print for Adidas. This is a clever man who studied fashion design at the Pratt Institute in Brooklyn NY, and has since built up a cult following and shown his clothes collections around the world, therefore can his potentially offensive design can be laughed off as an awkward coincidence? Adidas claim the sneakers have no association with slavery, with a promotional tagline that seems to focus on just how much everyone is going to want your shoes by asking, “Got a sneaker game so hot you lock your kicks to your ankles?” Indeed, their target market is the Urban Youth, consumers aged 14-22 years old, and therefore I can’t see them deliberately doing anything to damage their brand appeal, and definitely not doing anything to offend the older generation, the parents of their target market, who in all probability are the ones paying out anything from $30-$350 for a pair of brand sneakers for their insistent offspring. Although Scott has always been fairly mysterious about his date of birth, it’s no secret that he set up his own fashion brand in 1997 when he was about 21 years old, putting his birth year in the mid-70’s. When questioned about his inspiration behind the JS Roundhouse Mid, he claims that they are in actual fact inspired by the furry toy ‘My Pet Monster’ that was originally produced by American Greetings back in 1986, and came with break away orange plastic handcuffs that the child owner could remove from the Monster and themselves wear. These toys have a huge nostalgic appeal to children of the 80’s, so much so that Toymax released a commemorative doll in 2001. Scott goes on to state that, “My work has always been inspired by cartoons, toys & my childhood,” in a statement emailed to The Associated Press. So what’s going on here? Was Jeremy Scott genuinely inspired by the orange handcuffs of an 80’s toy? Did Adidas and Scott fail to see the potential connection their product could have to slavery? Did they see the link and decide to go ahead and ride the wave of controversy, with a convenient ‘My Pet Monster’ story ready as an explanation? Are PC groups too quick to take offence and create cultural issues for the sake of stirring up a media storm? Would you have worn the sneakers regardless of the potential social and cultural storm, or do you think the shackles were a step too far away from practicality and towards high fashion? Anyone willing to spend that much money on a pair of damn ugly shoes should be in shackles.